It’s official. U.S. Department of Transportation Secretary Ray LaHood announced today that he will step down from his position and not serve a second term. 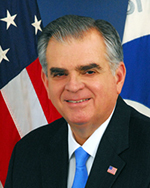 LaHood confirmed that he will stay at the department as long is it takes to find a successor. Mobility 21 is grateful for LaHood’s tremendous leadership in transportation and for working with the coalition to help invest in much-needed infrastructure projects in Southern California and the rest of the nation. Click here to read his full statement. 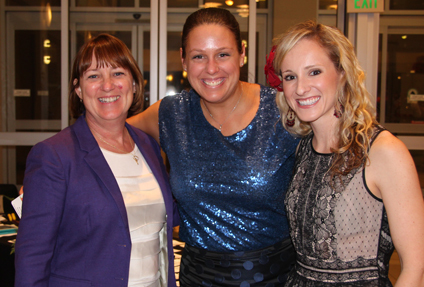 New Mobility 21 Chairwoman Anne Mayer joins Executive Director Marnie O’Brien Primmer and Communications Manager Kristin Slocum during a reception honoring the California Transportation Commission. 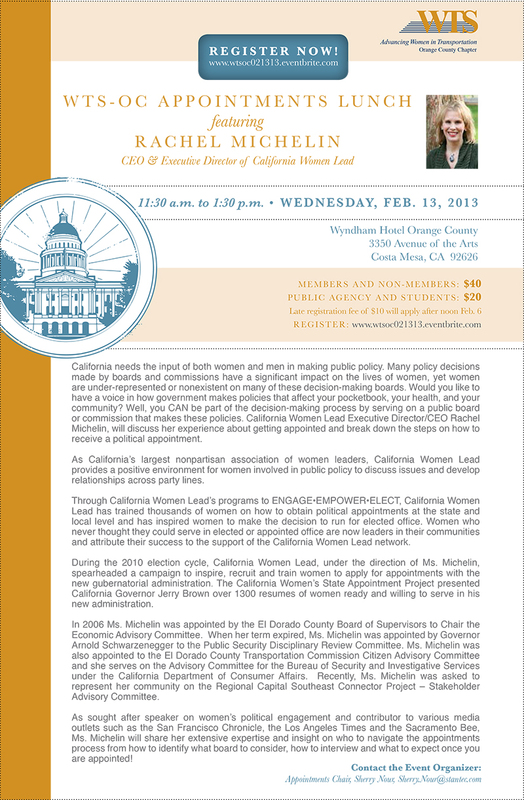 Anne Mayer, Executive Director of the Riverside County Transportation Commission, began her term as Mobility 21’s 2013 Chairwoman this month, marking the coalition’s first-ever female chair to take the helm of the transportation advocacy organization. 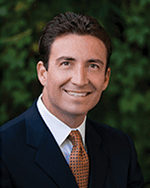 Paul Granillo, President & CEO of the Inland Empire Economic Partnership, will serve as Mobility 21’s Vice Chair and Darren Kettle, Executive Director of the Ventura County Transportation Commission, is this year’s Treasurer. California State Senator Michael J. Rubio (D-Shafter), Chair of the Environmental Quality Committee, answers Mobility 21’s questions this month on his plans to modernize the California Environmental Quality Act. M21: How do you plan to tackle updating the California Environmental Quality Act (CEQA) in 2013? SR: We are in the process of taking input from all parts of the state and gathering case studies to determine, most importantly, where CEQA has worked well and where it has been abused or been used to obstruct projects that would actually benefit the public health and environment. Working closely with Senate President pro Tem Darrell Steinberg, we are striving to arrive at a framework of meaningful CEQA improvements that would help accomplish the state’s goals of supporting sustainable communities and well planned regions. As the incoming Chair of the Senate Environmental Quality Committee, we will have a robust discussion to determine the best ways of accomplishing this, while also preserving the best elements of CEQA, such as direct public comment and access opportunities so that we may continue to protect California’s valuable natural resources. M21: How will transportation projects factor into your analysis of needed updates to CEQA? SR: All projects—transportation and otherwise—are being looked at to see how CEQA is currently working. For instance, the Metro Expo Line Extension in Los Angeles, connecting Santa Monica to downtown, comes to mind as a great example of how transportation projects would benefit from our effort to update this important law. Large public infrastructure projects like these tend to be those that are most likely to be challenged, so there needs to a process to ensure that both large and small environmentally-friendly and job-creating projects stay on track. M21: What can the transportation industry do to assist your efforts to achieve meaningful reforms? SR: I would suggest that representatives from the transportation industry engage in the CEQA update efforts and forward any ideas you might have on what can be done to expedite transportation projects, as well as sending our office any case studies you might have on where CEQA has worked well or been abused in your area of expertise. M21: Duplication of environmental reviews is a serious concern for financially strapped public agencies; would you support efforts to substitute California’s environmental rules for federal rules where CEQA meets or exceeds federal requirements? SR: Duplication of regulations, rules and permits is an ongoing challenge, as is coordinating with the federal government, but this coordination could also certainly be the conduit for solutions. For example, the Desert Renewable Energy Conservation Plan is attempting to plan with local, state and federal departments within a region that have a stated interest and will be necessary to permit renewable energy projects in the California desert. This type of proactive planning with upfront coordination with the federal government is where I have seen these challenges best addressed. California already leads the nation in many cases, though this then requires us to engage in the collective task of bringing others along. I believe we can coordinate with the federal government, but substituting our regulations for theirs would be a much more monumental endeavor requiring federal law changes. We are working strictly at the state level at this point and hope to implement changes that minimize the potential impacts of juxtaposed state and federal regulations. California State Senator Carol Liu (D-La Canada Flintridge) and Senate Majority Leader Ellen Corbett (D-San Leandro) have introduced constitutional amendments to reduce the voter threshold for local transportation sales taxes from two-thirds to 55 percent (SCA 4-Liu and SCA 8-Corbett). If approved by a two-thirds vote of both houses of the legislature, these amendments would be placed before California voters at the next regularly scheduled general election. Lowering the voter threshold would pave the way for counties currently without transportation sales tax measures and also provide self-help counties a better opportunity to extend existing measure sunset dates, providing additional revenue for transportation projects. You’re invited to attend an open house to provide feedback to Caltrans on the California State Rail Plan. Caltrans will be presenting the draft of the plan, which establishes a statewide vision, sets priorities and develops implementation strategies to enhance passenger and freight rail service in the public interest. To review the draft plan and submit your comments, please join Caltrans at one of the five open houses. The public comment period will begin on Friday, Feb. 8 and end on Monday, March 11. The draft plan will be available on Feb. 8 at http://californiastaterailplan.com/project-materials. Tuesday, Feb. 12 from 4:30 – 7:30 p.m.
Thursday, Feb. 14 from 3 – to 6 p.m.
Tuesday, Feb. 19 from 4:30 – 7:30 p.m.
Wednesday, Feb. 20 from 4:30 – 7:30 p.m.
Thursday, Feb. 21 from 4:30 p.m. – 7:30 p.m.
Tuesday, Feb. 26 from 11:30 a.m. – 1 p.m.
J. Christopher Lytle, Executive Director of the Port of Long Beach and Mobility 21 Advisory Board Member, speaks during the groundbreaking ceremony marking the start of construction on the Gerald Desmond Bridge replacement project. 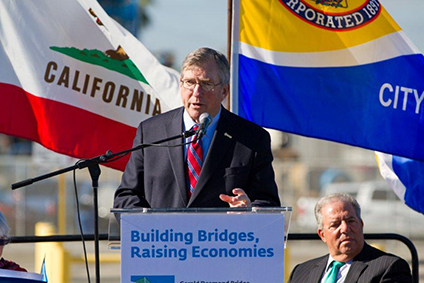 This month officials celebrated the kickoff of construction on a $1 billion project to replace the primary bridge at the Port of Long Beach, a four-year effort that will enhance a critical link in the nation’s trade system and improve an important transportation corridor for California. Federal, state and local officials gathered near the base of the existing Gerald Desmond Bridge for a ceremony that included two helicopters hovering at 515 feet – the eventual height of the two new towers. The new bridge will allow the world’s biggest cargo ships to reach the inner berths at the Port of Long Beach and simultaneously expand a strategic highway that carries 15 percent of all goods coming into the U.S. The replacement project will allow the Gerald Desmond Bridge to remain in use while the new bridge is erected adjacent to it. The new bridge is among $4.5 billion in current and planned improvements to further modernize the Port of Long Beach and keep it competitive. Work on the new bridge will generate, on average, 3,000 jobs a year during construction. 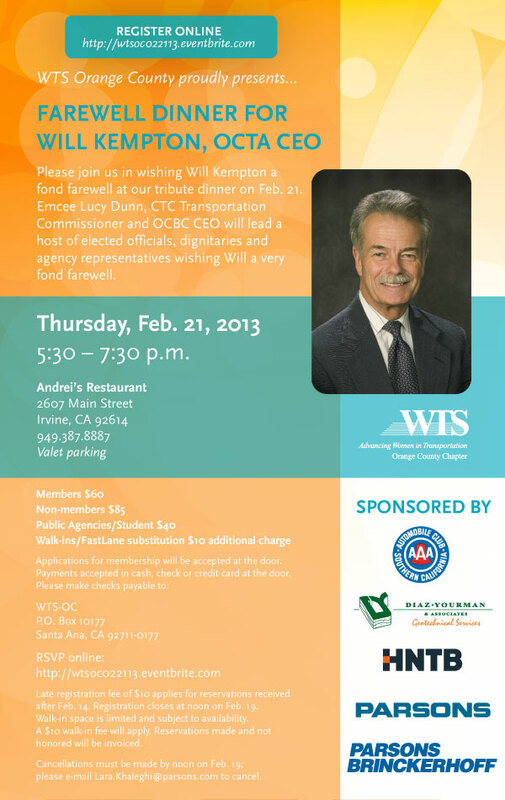 Join OCBC and BIZPAC Trustees at the 5th Annual Roast and Tribute, honoring Will Kempton, CEO, Orange County Transportation Authority (OCTA). Emceed by Peter Buffa and professional comedian and Hollywood entertainer Bob Zany, the annual event will feature spirited stories from Kempton’s friends and associates. Thursday, Feb. 28 | 5:30 – 9 p.m. Sponsorship opportunities are available between $2,500 and $15,000. 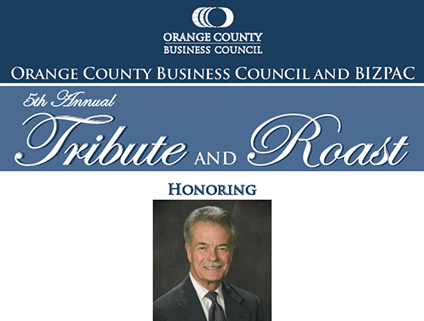 Contact Leslie Dods, Director of Events, at 949.794.7241 orldods@ocbc.org. 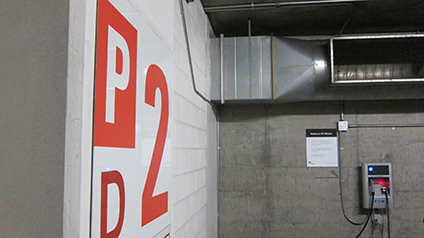 Funded by a grant from the California Energy Commission, Metro is collaborating with EV Connect to offer electric vehicle charging stations at several park and ride stations. As part of Metro’s continuing efforts to help create a more sustainable planet, electric vehicle (EV) drivers will soon be able to charge their vehicles for a nominal fee at five Metro park and ride stations: Union Station, Sierra Madre Villa Station, Willow Station, El Segundo Station and Universal City Station. Each of the five location will have facilities to charge up to four vehicles at a time. The first two locations, Union Station and Sierra Madre Villa Station, will open to the public in early January 2013. All stations will be open by mid-February, 2013. Mobility 21 Executive Director Marnie O’Brien Primmer celebrates winning an award from WTS Inland Empire with Mobility 21 Board Member Ray Wolfe, Executive Director of the San Bernardino Associated Governments, and Anne Mayer, Riverside County Transportation Commission Executive Director and Mobility 21 Chair. 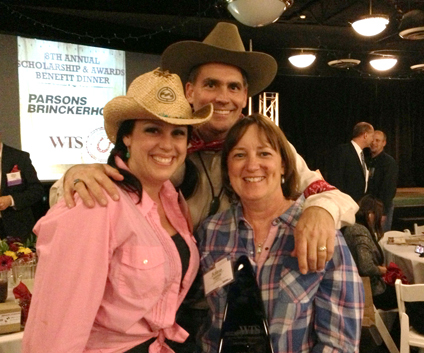 Mobility 21 was named Employer of the Year by the Inland Empire chapter of Women’s Transportation Seminar (WTS) this month during a western-themed awards and scholarship dinner in Norco, Calif.